Set / Lot of Linkin Park (RIP Chester Bennington), including ~ Flag with group picture. LINKIN PARK. MINI COLLECTIBLE GUITAR. PERFECT GIFT ! "Yup, last 3 are Mike, Joe, Rob. Top one is probably Chester.but the second one is interesting. Any idea if it could be older than 2003?". " That would be really really cool if you have a signature from Koziol. "Yup, last 3 are Mike, Joe, Rob. Top one is probably Chester.but the second one is interesting. Any idea if it could be older than 2003?". "That would be really really cool if you have a signature from Koziol. Linkin Park Badge Set Official. 4 x 38mm (1.5in) Badges. Used in good condition. This appears to be two different versions of the ever popular series. All are different i think. 100% of sales benefit our charity. This is a rare tour used Linkin Park drumstick from the early 2000s. New Linkin Park R ing (Never Worn! ). Pewter with Silver Plating. Size: 8 1/2 (USA Sizing). It Is Signed on The Cassette Case & Not the Actual Cassette. Includes Beckett Sticker on Cassette, and Matching Certification Card. UNIQUE Linkin Park Signed Rolling Stone Magazine. Many pages with lots of fantastic colour photos. Magazine dated 14th March 2002. This is a one off, you wont find another anywhere. The clock face itself is gloss black painted drum skin featuring a linkin park design in white with silver glittery dots around the edge. A large range of different hand designs & colours & a choice of ticking or none ticking is available.
" Linkin Park ". Hybrid Theory. Platinum Music Award. What Is This Award?. Hand signed gate fold vinyl. Opened only for signing. Chester bennington - linkin park 15cm high by 7.5cm wide. candles can cause fires so never leave a candle burning unattended. THE PICTURE SHOWS 4 PIC'S BUT THAT IS ONLY SO YOU CAN SEE THE BACK AND FRONT IMAGES. YOU WILL RECEIVE 2 PIC'S PER ORDER. ONE MIKE SHINODA AND ONE CHESTER BENNINGTON. We will not take an item back because you do not like it, bought it by mistake, changed your mind or abused or broke it. They are a little dirty around the edges. 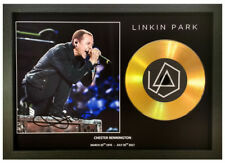 Chester Bennington (Older Version of Signature). Includes JSA Full Letter of Authentication with Sticker on the Letter (Not on CD). JSA Certification Number: Z89998. Brad Delson. Linking park meteora album world tour t shirt size XL Worn condition no flaws just cracking of graphic All measurements taken laying flat Chest 23 in. Length 29 in. Sleeve length 16 in. Graphite drawing of Chester Bennington who was the lead singer of the rock band Linkin Park. My portrait of Chester took a month to complete. It was a tribute for his tragic death. LINKIN PARK. Presented image on disc. The background image consists of a record player. A Rhinestone has been placed into the middle of the customised Record label for added flare! THE PICTURE SHOWS 2 PICKS BUT THAT IS ONLY SO YOU CAN SEE THE BACK AND FRONT IMAGES. YOU WILL RECEIVE 4 PICK PER ORDER. We will not take an item back because you do not like it, bought it by mistake, changed your mind or abused or broke it. This is a poster from the 2004 Meteora Tour. The full band has signed this and it has the backstage pass attached to the front for authentication. It was signed at the show in Greensboro NC of the tour on March 02. This was one of the last dates I believe before Chester had eye correction surgery. Before that he could never see the crowd. It is far from mint, folds, pin holes, and a small rip, but it has character. This is a genuine item that was done for a fan at a show and not something manufactured for sale. To me that is cool. I am not even sure how you put a price on something like this. I have held onto it for a while but need to clear some stuff out. We will not take an item back because you do not like it, bought it by mistake, changed your mind or abused or broke it. If it's our fault we will gladly take care of any and all issues. Doing so will eliminate any issues and you will receive exactly what is described. PROJEKT REVOLUTION TOUR, Linkin Park, Genuine Laminated Backstage Pass MINT! Approximate Laminated Size 2 3/4" x 4 1/2". Fairly Rare and Hard to Find. What you see is what you will receive. Best Quality. ORIGINAL not a Copy. ~NEW~ Pewter Belt Buckle. Cast in solid pewter. Chester Bennington. Includes JSA Full Letter of Authentication. JSA Certification Number: Z95161. Brad Delson.